Rich Schultz/GettySeveral Philadelphia Eagles players had already indicated that they planned on skipping the ceremonial White House visit after their Super Bowl win in February, but in a statement Monday, the White House appears to have disinvited the team entirely. The White House disinvited the Philadelphia Eagles from its traditional post-championship visit on Monday after some players indicated they would not be attending. While the Eagles were prepared to send a smaller delegation, the White House instead chose to cancel their invitation altogether. In 2017, several Patriots players chose to skip the visit, both because of disagreements with Trump as well as “personal family matters,” but the visit still went on as scheduled. The White House appears to have disinvited the Super Bowl champion Philadelphia Eagles from their ceremonial visit. Back in April, the Eagles had said that the team had not yet accepted the invitation from the White House, but were actively discussing it. “We are honored to receive this invitation and view this not only as an opportunity to be recognised for our on-field accomplishments but also as an opportunity to engage in productive dialogue with the leaders of our country,” a spokesman said at the time. The Eagles were prepared to attend with a smaller group of players, but the White House claimed that “the 1,000 fans planning to attend the event deserve better,” and decided to disinvite the Eagles altogether. “These fans are still invited to the White House to be part of a different type of ceremony-one that will honour our great country, pay tribute to the heroes who fight to protect it, and loudly and proudly play the National Anthem,” the statement read. 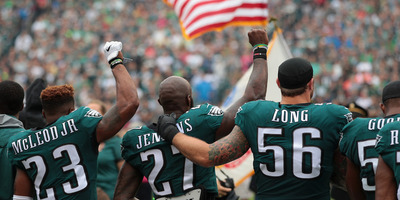 According to ESPN’s Adam Schefter, a large group of Eagles players, including most – if not all – black players on the team, had indicated that they would skip the ceremony. ESPN’s Sal Paolantonio also reported that the White House did not inform the Eagles of the decision and the team found out when the statement was released. Several Philadelphia players participated in the ongoing protests against police brutality and racial injustice that became a dominant story throughout the 2017 season. While no Eagles knelt, some of them took part by either raising fists or linking arms as the anthem played before their games. Four players had already said they did not plan on attending the White House ceremony. Even with some players publicly criticising Trump at the time, the White House still hosted the Patriots. That will not be the case with the Eagles. “The Eagles call the birthplace of our democracy home, so it’s no surprise that this team embodies everything that makes our country and our city great. Their athletic accomplishments on the field led to an historic victory this year. Fans all across the country rallied behind them because we like to root for the underdog and we feel joy when we see the underdogs finally win. I’m equally proud of the Eagles’ activism off the field. These are players who stand up for the causes they believe in and who contribute in meaningful ways to their community. They represent the diversity of our nation-a nation in which we are free to express our opinions.